DUBAI, United Arab Emirates — Global efforts to improve freight efficiency and reduce carbon emissions will require a multifaceted approach that includes not only vehicle technology, but also better fleet management and capacity utilization, experts said. Although fuel-saving technologies such as battery-electric vehicles and hydrogen fuel cells are beginning to show promise in commercial transportation, there are many other ways for shippers and carriers to take immediate action, said Sophie Punte, executive director of the Smart Freight Centre. “While we of course need to invest in the long-term energy transition, we need to look right now at energy efficiency and optimizing loads,” she said here Nov. 16 at the Shell Rimula Ultimate Stopover event. Fleet operations worldwide can boost efficiency and reduce emissions through improved fleet management, including driver training, better equipment specification and maintenance, and the use of information technology, Punte said. The Smart Freight Centre, a global nonprofit based in the Netherlands, works with multinational shippers and transportation firms to reduce emissions in the transportation sector, in part through developing global guidelines and strategies. Meanwhile, refinement of existing vehicle technologies also can chip away at fuel consumption and emissions. 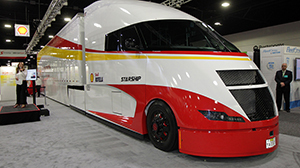 This year, Shell highlighted its vision for more efficient freight transportation with its Starship Initiative concept truck. The vehicle, built through a partnership with AirFlow Truck Co., features a variety of fuel-saving technologies, including aerodynamic improvements, an active grille cooling system, roof-mounted solar panels, predictive cruise control, low-rolling-resistance tires and low-viscosity lubricants. In May, Shell tested the truck’s efficiency on a cross-country run from San Diego to Jacksonville, Fla. Shell said the truck’s freight ton efficiency — the total amount of energy needed to move a load from one point to another — was 2.48 times greater than an average truck in North America due to improved miles per gallon and optimized payload.